We first introduced you to the Tuggo in a roundup of last years Backer’s Total Pet Expo. This toy had sparked quite the buzz at the show and was being described as seriously tough. With 2 strong chewers in the house, we made a point to stop at their booth and see what all the fuss was about. There we were able to see one of the dogs at the show doing its best to put the Tuggo through its paces. We also spoke briefly with the inventor, Adam Harrington, who gave us a rundown of its unique features. Unfortunately we were flying home and could not bring one back with us! We reached out to Tuggo a few months back however, and they were kind enough to send us 2 of each size to test out and giveaway to our readers! Looking for a Tough Dog Toy? Look no further, you have found it. A ball and a rope combined? This idea was the brainchild of Adam – after tons of frustration and lots of wasted money spent on toys and balls that just didn’t hold up! Adam wanted to create a toy that would be resistant to destruction while promoting exercise and building muscle. What Adam came up with was nothing short of brilliant for high energy, active dogs. This innovation even went on to win the 2014 PetSmart Innovation Station award! To understand what makes the Tuggo special, we will break down it’s features one by one. 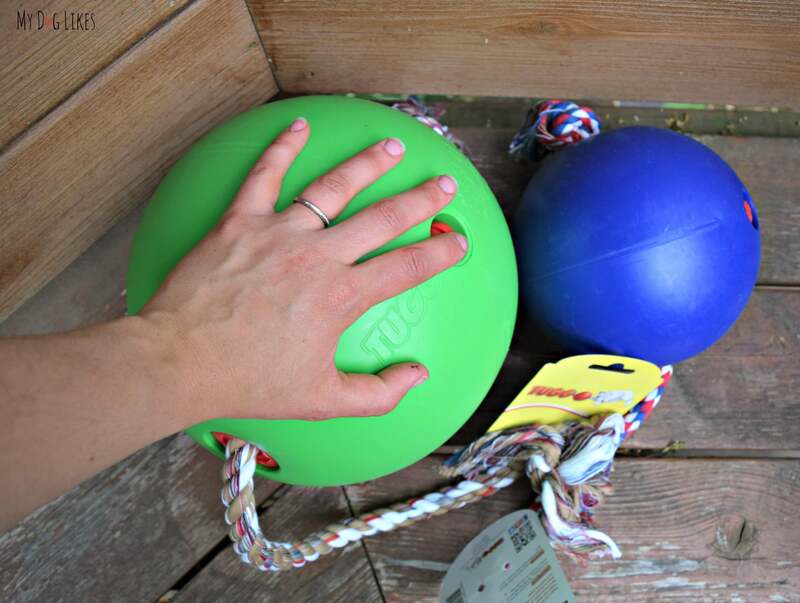 The Tuggo ball is constructed of an extremely durable plastic that will withstand abuse from even the toughest and most persistent dogs. 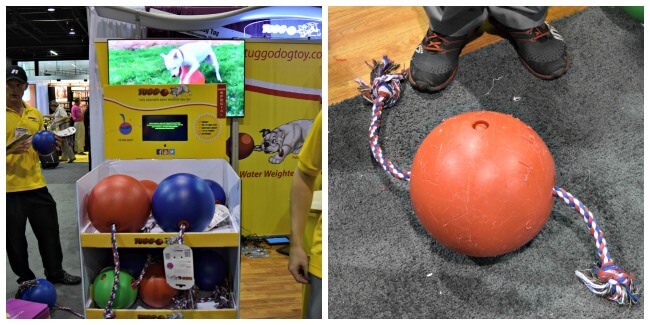 Like we shared before, we saw the Tuggo being used and abused first hand by a very high energy dog at Backer’s Total Pet Expo. This ray of sunshine pulled, pounced, clawed, chewed, and scratched at this thing for hours. The results, nothing more than a few surface scratches! WOW! Still skeptical? Check out this video of lions playing with the Tuggo! In our house, ropes are not typically considered a “durable” toy. If left unattended Harley would EAT, yes I said eat, an entire rope. Certainly this toy is not designed to be left with your dog to eat, but depending on the intensity of play, your rope may begin to fray over time. Fear not, simply order a replacement for $5 on their website and you are back in business! No need to buy a whole unit! Without a doubt, the most unique feature of the Tuggo is that it can be filled with water. In fact, up to 20 pounds of water weight can be added to the Tuggo, providing additional resistance and exercise to playtime. 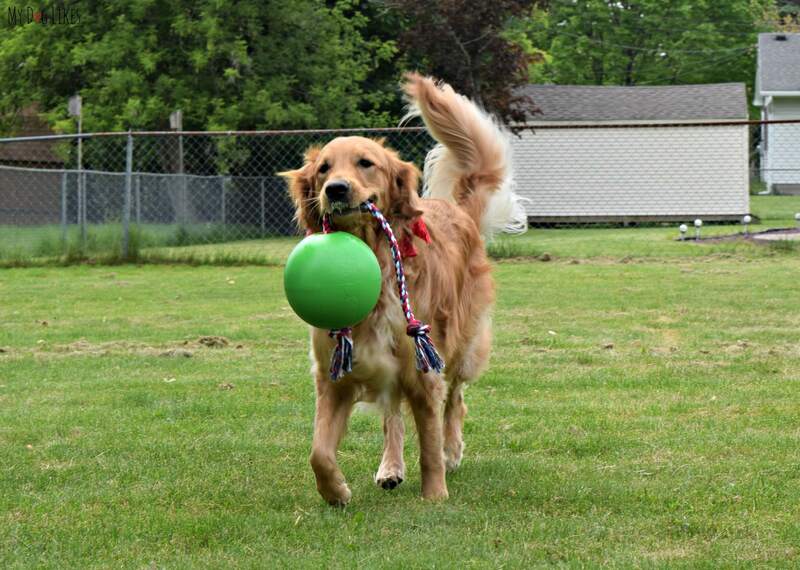 The water works double duty, giving your dog a workout while also adding a fun element to play. The sound of the water splashing around inside will entice your dog as well as cause the ball to move unpredictably. Adding water, sand, or gravel to the ball is easy. Simply use a screwdriver or some other strong flat object (a pocket knife and garden spade both worked for me) to unscrew the recessed plug and pour in. Play around by adding different amounts of water to see what your dog likes best. We tried it full, with just a little bit of water, and empty as a fetch toy! While it may seem like a pain to have to get a screwdriver to open this thing up, we really liked that the cap was recessed and could not be accessed by the dogs. As anyone with a tough chewer knows, if there is a spot of vulnerability, the toy is good as gone! There are many ways to play with the Tuggo. 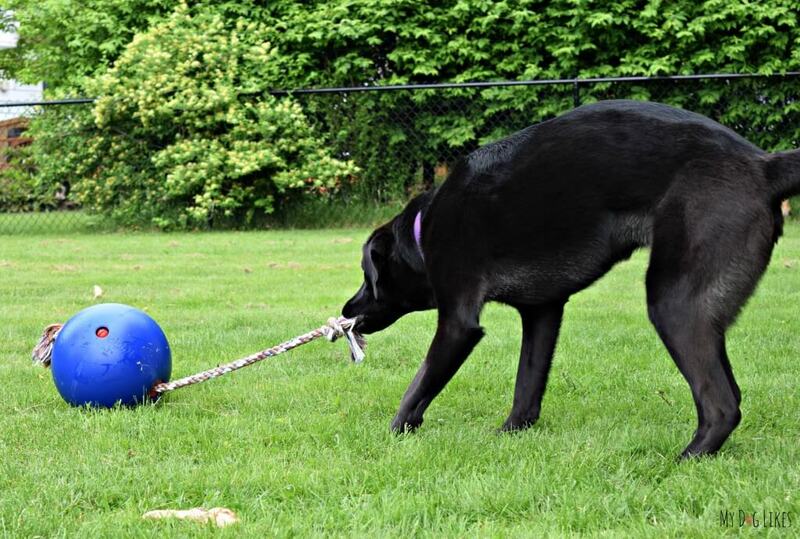 With the built in rope, it was designed to be used in human-dog AND dog-dog tug of war games. This rope is free to be pulled back and forth, yet is knotted at the ends to keep it attached. The motion of the rope sliding in and out creates some very interesting movement during play. 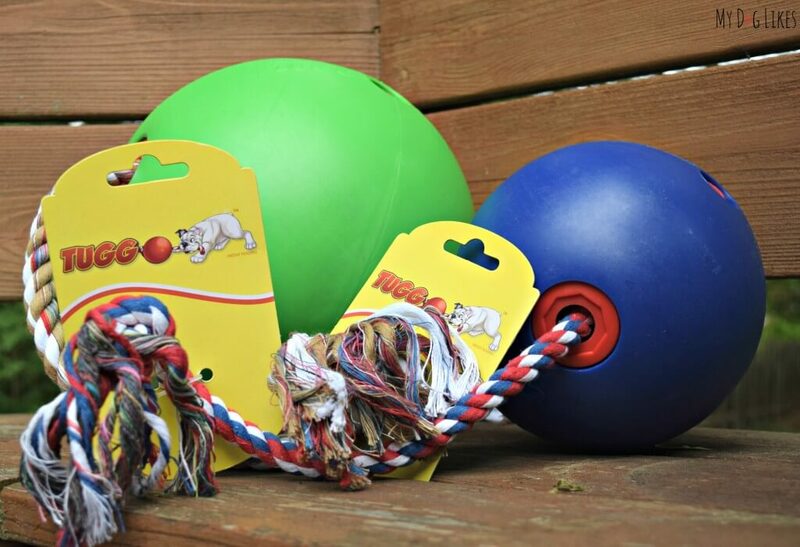 The easy to grab rope also makes it great for fetch and the tough ball ideal for pouncing and batting. Leave the Tuggo empty and if floats, making it just as much fun in lakes and ponds! The Tuggo comes in 2 sizes, 10in/7in diameters, and multiple colors. For solo play, I liked the larger size because the volume of water (in our case) was enough to provide resistance. For Dog-Dog or Dog-Human play I liked the smaller size because it was a little more manageable and less like a wrecking ball! 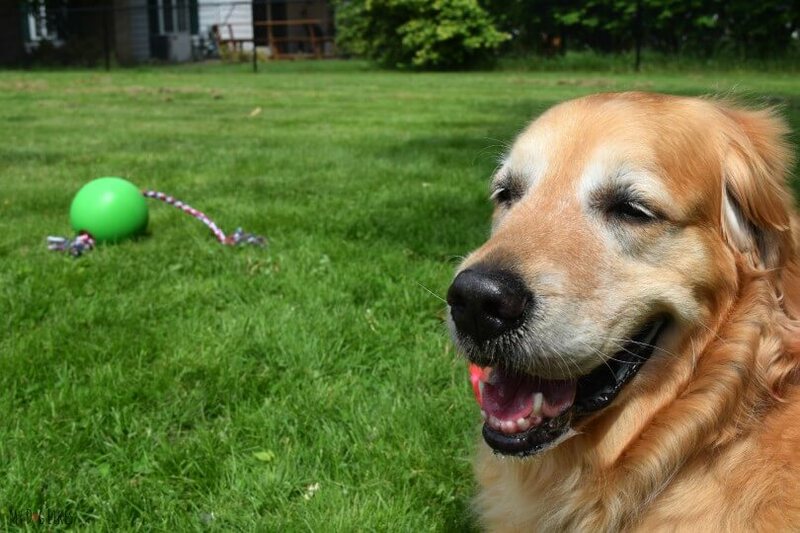 Deciding which size is right for you should come down to how your dog likes to play. If you think that your dog will be rough and relentless, go for the larger size. If your dog likes to tug and fetch it exclusively, I think the smaller size is perfect for many. Putting it to the test – Our Tuggo Dog Toy Review! As we have explained before, Harley is not one to play with toys – If it is not a stuffie he isn’t interested! While Charlie is always game to play with a new toy, we thought that the Tuggo would really shine in a group environment. We brought the boys and the Tuggo over to play with their best dog friends Laila and Meera. These rambunctious Lab sisters could surely help us see what it is made of! At first sniff, everyone was interested as I filled up the Tuggo. I started by filling it all the way up with water, under the assumption that after some play I would dump some out until I found the perfect amount. I rolled it over the ground (like a bowling ball) and the chase was on. Laila took off (I know, I was surprised to see the old girl run after it too), and was the first of the dogs interested in checking it out. A few pulls on the rope was all she needed to realize that this was too much work for a distinguished lady to sustain. In hindsight, I realize that I filled it too high and it was too heavy for the energy level of our group. I decided to start over and use the smaller size to entice play. Soon enough the girls were involved in an adorable game of tug o’war. Charlie of course could not be left out of the action, and he was all on board for a game of fetch. I’ve shared with you that Charlie can be a bit skittish of new things, but with a little bit of time he seemed to get used to the unpredictable bounces and sloshing noises that it made. 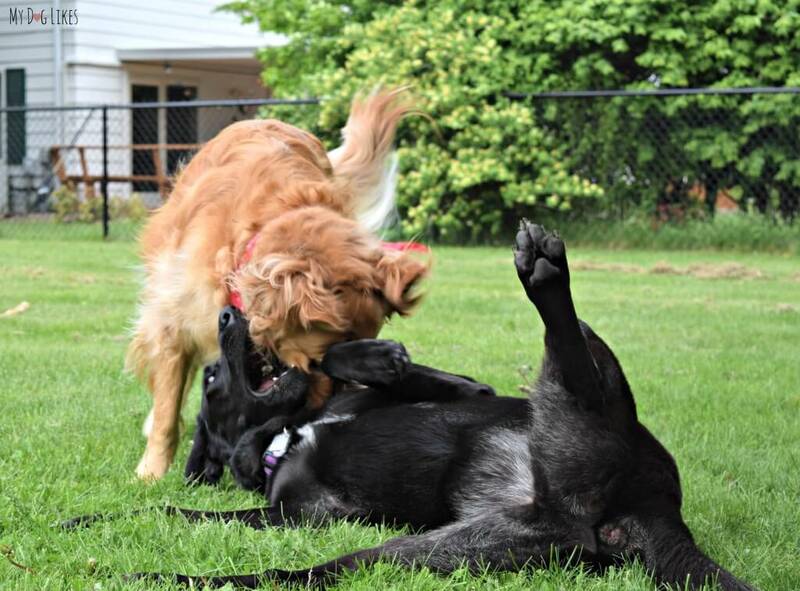 After a few minutes of fetch, Charlie got distracted by his BFF and a wrestling match ensued! Could these two be any cuter? How many times have you heard that a toy is “indestructible” only to be disappointed in mere minutes? This frustration was a huge reason for us creating this site in the first place! We feel very confident saying that this is one of the toughest dog toys around. I simply cannot imagine a dog doing serious damage to the hard plastic of this toy. What about the rope? Worried that your dog will settle in and chew it to shreds? Well, if so, no big deal because the Tuggo was cleverly designed to allow the rope to be replaced without having to purchase an entire unit. Charlie would play fetch for hours with the smaller sized Tuggo ball, but I think this toy really shines with high energy dogs who love to pounce, roll, scratch, and attack it! Our boys weren’t the best fit for the larger version of this toy because that is not their play style, but there are very many dogs out there who would get hours of entertainment from this durable tough toy. We would recommend this toy for dogs with lots of energy to burn without hesitation or as a typical fetch toy for your average dog who just loves to retrieve! Interested in seeing if you dog has what it takes to tackle the Tuggo? You can also now buy Tuggo at your local PetSmart! Great review. Leave it to the Labs to like a toy with a “ball” in it! Bailie enjoys hers all on her own. I saw that picture of Bailie on Facebook and she seemed to be having a great time! Our boys definitely needed a bit of friendly competition to really get into the action! Looks like a great toy – our dog Becca – our fetch queen – would have loved it. Oh that looks like great fun if you like a good game of tug. I never could get into tug though. I’ve relocated to http://www.browndogcbr.net. There is a link on http://browndogcbr.blogspot.com . Haley would love this! I’ve seen these before but haven’t tried one yet. You definitely should – this is absolutely the toughest dog toy we have ever seen! My dog would love this. She loves playing to toys. Ooooh, doesn’t that look awesome?! Yes!! Mine love playing tug games. Do you have to be US residents to enter the giveaway…? Where are you located? We are shipping these out ourselves so probably will just stick to US and Canada! If it will hold up to lions, it should hold up to anything! I think even the smallest size is too big for Mr. N lol. Yes, this toy is definitely better suited for the big dogs! Not sure if Mr. N could maneuver it very well!! Thanks! Yes, this toy may be a bit large for Kilo but is a great option for those dogs who really test the durability of their toys! We met these folks at Blogpaws and got a Tuggo of our very own! Great toy! We have a high energy doodle pup coming to stay with us next weekend and I think this will be a perfect toy for her! ohhh what a great review and very cool toy, Gambler would love this toy, he likes balls and ropes and a all in one would be great, I like the idea of adding water or sand to make it more of a challenge. Gambler is crazy and can pick up a 21# scratch grain block for the chickens so he would give this a run for it’s money. For active sporting dogs like yours, I could see this being a BIG hit! We got one of these to try at BlogPaws and Luke can’t wait to test it out. I hadn’t even had time to look at the paperwork yet, so didn’t know about the replaceable rope. Since destroying the rope will be the first thing Luke and Sheba want to do after romping around with it, and my biggest concern, I am so glad to know it can be replaced. Thanks for the tips too, I think I’ll try it out with a smaller amount of water to start. Luke can carry some pretty heavy things, but Sheba is not quite as strong. It sounds perfect for Luke! I know he is a strong and energetic pup! Sheba will love the rope too I am sure! My dog is obsessed with tugging, she even wants to play tug with her tennis balls, which I keep telling her you can’t do lol! We love the Tuggo because you can play with them or she can play by herself if you add some water or sand! My dog is a black boxer mix/rescue dog. My dog loves tug toys but he destroys most of them so this would be great! He is a newf/cheaspeake bay retriever cross. Mine love tug but this seems awesome. Our older dog has calmed down a bit with age, thankfully chewing only on his goodies. Our puppy eats everything -every.thing.! He’s literally chewing a hole through the floor (or trying to- I have no doubt he’ll succeed if he keeps sneaking around us. We’d love something indestructible and it would be great to get our older dog playing a bit more too! It sounds like this could be a great fit! Good luck! We agree! We are donating our extra Tuggo to a Pitty rescue. I know they will love it because they are such fun at playtime! My pup would love theses. She is really rough on her toys and loves to try to destroy them. 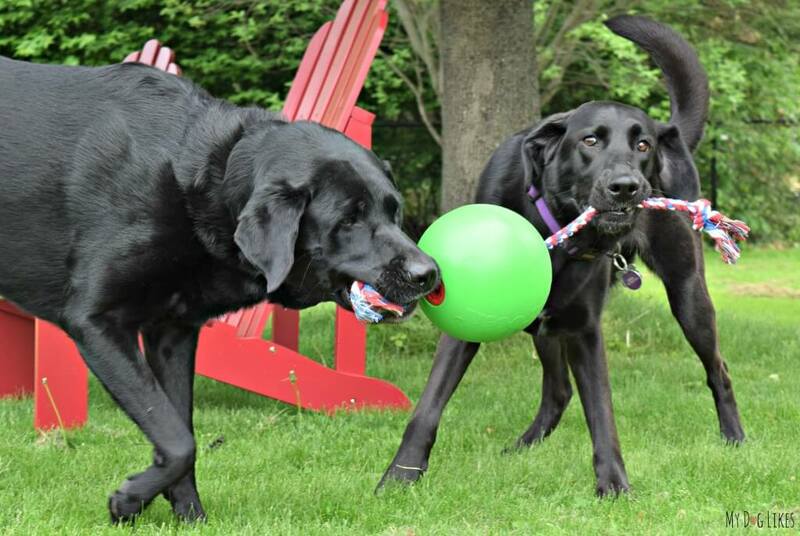 My 2 labs are both close to 100 pounds and would love having this big tuggo toy to tug on! Our Bella does. She loves tug of war but usually ends up ripping whatever we are playing with. She is super strong so this would be perfect for her. Thank y ou! Good luck Crystal! It sounds like this would be perfect for your tough puller! 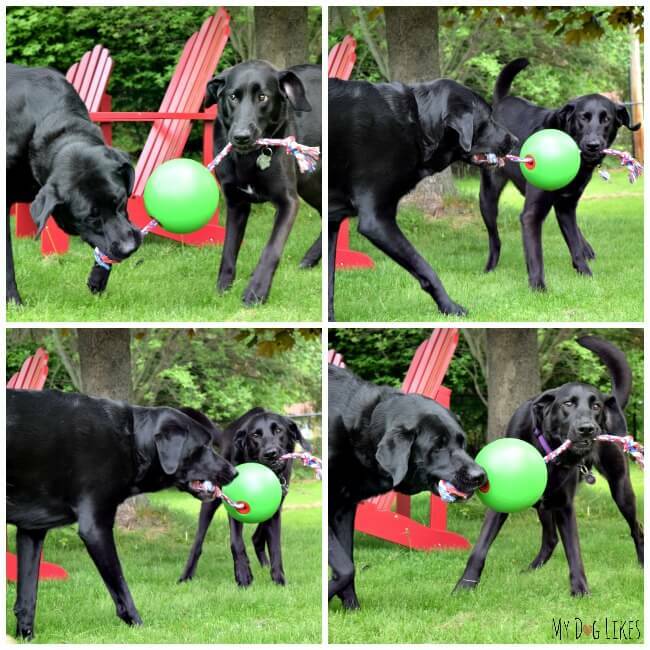 My lab mixes love balls, and they love tug of war, so this seems like the perfect toy for them! I have three pups who love to play tug of war – a pit mix, a puggle & a Chihuahua…the pit mix is a sweetheart & lets the Chihuahua win…most times. Thanks! My sisters Goldendoodle destroys toys in a matter of moments! He couldn’t get his jaws around the central ball, so this might last a season! Hé loves toys to play with. Oh, yes, our dogs have the energy and the size to take on this toy! Every toy we have gotten Lucy she has knocked herself silly with it. I do believe Tuggo may solve her problem and she can take it on and not knock herself out! Schooner and Skipper would love to have a Tuggo. They love to play tug of war! Plus Schooner will chew on the rope while tugging on the rope until he can chew through the rope and poor Skipper goes flying! Our crazy girls would love to play with this toy they would have a total blast during the summer. HA! Our boy Buzz would love it, as he is the king of fetch and he just loves to play with balls overall! I have a feeling that even our girl Missy might be enticed by the water inside of the ball..she usually doesn’t care too much about toys, but add water to the equation and she’s in!! Oh yes, my dog has what it takes for a Tuggo. He is a four year old Australian Shepherd that is high energy and always on the go. He plays with a mini donkey and they run and play tug of war. Dixie, our Golden is only 15 weeks old and loves to play tug. Once again, we have to perform “surgery” on her favorite tug ball because she ripped it. Would love to have something more durable. My year and a half baby is our newest member.she is a lab pit mix.anything she can get to chew,she loves to destroy,lol.if she doesn’t destroy this,it’s a guarantee to be on my shopping list.thanks so very much for sharing. My dog loves to play tug of war so she would love to play with this! 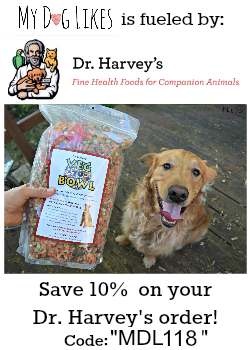 my dog loves playing with other dogs, so i bet he would love to bring this to the dog park to share with his friends! luci the rat terrier would give these a run..she loves to play. This is a great summer toy for my dogs! Both are extremely destructive , removing all fur from tennis balls, the sutures from baseballs, and unbraiding rope toys ! This would be a great toy for them , especially considering the fact that it floats on water – since they love playing in pools or beaches because of the Miami heat ! This would be perfect for a couple of Great Danes! Good luck! My dog has what it takes for Tuggo. Does Tuggo have what it takes to survive him? He is pretty rough on his toys! Our dog loves toys and has lots of playful energy. He would love it! Molly will love this toy! Although Nala is a corgi, her best friend is an Aussie and they live to play tug! They’ve ripped apart sofa pillows together along with stuffed toys and many other toys. I think they would meet their match with one of these toys! They’d have tons of fun! I think my Springer Spaniel, Calin, would love this toy. He’s fairly toy-motivated. If he likes to chase, retrieve and squeak, this will be a winner! My crazy dog would go wild over this toy. It looks like it’s made for the kind of play he likes! My Frenchies love to play tug with each other. Can this toy stand up to The Rad Frenchies? I believe 100% that it can! I would also love to see video of them going after it! I have two large pitties so they could deff take it on!! My dog would love this, she is a lot like a lion! I have 3 Jack Russell terriers that would enjoy this so much. Definitely! My pitbull and lab-mix pups love to play tug-o-war! It really would! It is the toughest! I do believe my Jack Russell Terrier mix has what it takes to take on a Tuggo Dog Toy. He loves to pull! For sure! It really is such a fun toy for multiple dogs to play with, you just have to play around with how much water to put in! It sounds like he would be the perfect fit! My dogs, Kouga and Artie are perfect to take on the tuggo. These two play very hard and they have managed to kill toys that are deemed indestructible. Shiloh’s not really a large dog, but he’s pretty tough and is crazy about tug. Wager is a little guy, but his “real” name is Challenge Accepted- and he lives up to it! 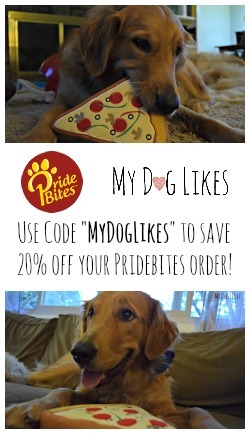 My dogs are crazy energetic and toy motivated so they would love these! I have two four year old pups one pit and one bulldog. He tries to pull on his stuffed animals with me all the time. He’s a golden as well. I am so jealous! Rodrigo LOVES his Tuggo toy. He immediately got to work chewing off the rope. On day 3, the rope was gone and he just played with the ball like he was playing soccer. Then the ball rolled off. We live on 5 acres. I’m too tired to go find it now. But I will have to or we’ll never find it – LOL. Hi Kim! How funny! It sounds like Rodrigo is the perfect kind of Tuggo dog and it certainly up for the challenge!! I’m guessing the ball could be anywhere and will turn up when you least expect it! Ha! Thanks for checking out our blog, we are big fans of yours! Yes, my dog has what it takes! She’s a big, white, fluffy Great Pyrenees! She’s a chewer!